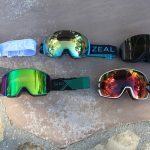 The LCG is intent on challenging Oakley’s Airbrake for the title of best interchangeable-lens goggle on the market. It’s not there yet. Goggles like the LCG aren’t cheap. But more often than not as a goggles consumer, you get what you pay for. No real problems here. There is plenty of air between your eyes and the inner lens, and the goggle breathed well on my face. One of the widest in any ski or snowboard goggle. This is perhaps the biggest advantage for the LCG when compared with the Airbrake. One of the goggle’s shortcomings is a lack of any affixed point from the lens to the frame above the nose. If that gets compromised in a crash (i.e. if the lens bows out for even a moment), snow infiltrates the seal and floods the goggle’s interior. Among the best-fitting goggles I’ve tested. This goggle is not for thin faces, though. The look is slightly bug eyed and loud, but it’s also sleek and in line with the latest trend in goggle design. Very comfortable eyewear overall.